Hiking excursions, fishing, backcountry camping, mountain biking, rock climbing, swimming and more in the Smoky Mountains of Western North Carolina. Local knowledge you can trust. 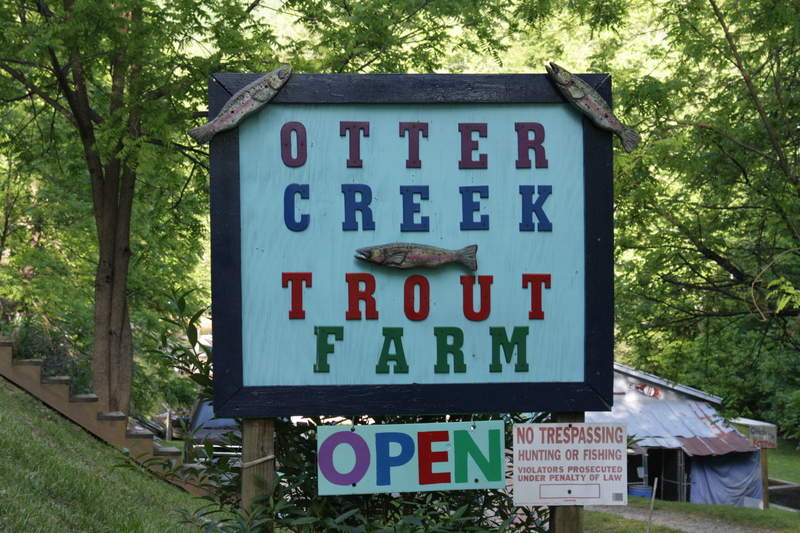 Take a family & kid-friendly trip to the North Carolina mountains this summer, near Franklin NC, to experience Otter Creek Trout Farm. 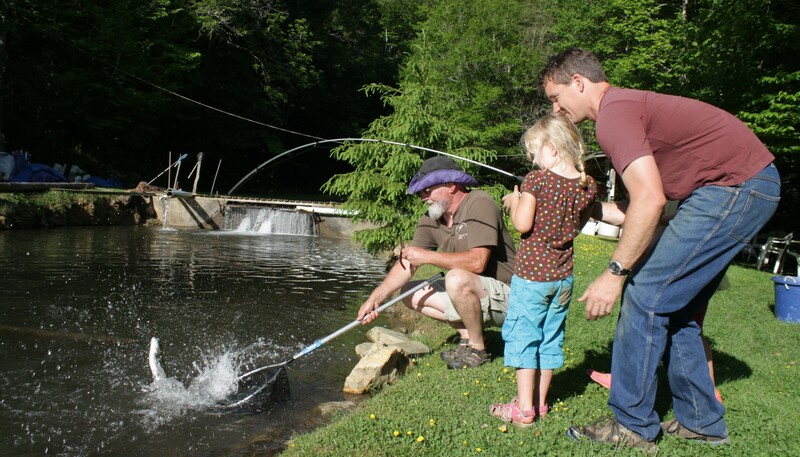 The kids will have a fabulous time pond fishing, learning, and simply watching the beautiful trout at the farm. Alex and Nicole, owners of Otter Creek, will undoubtably welcome you with open arms. I had the opportunity visit their unique property last summer, tucked in the scenic Nantahala Mountain range of Macon County. During my visit, I sat with Alex beside Otter Creek (which borders the entire property, and is available for private fishing outings by appointment), as he told me a bit more about the process of raising NC Mountain Trout. He has some cool stories of how he’s grown his business over the years. It’s tough work to produce such a beautiful product, which is Rainbow Trout. Such a peaceful property to visit. If you close your eyes for a moment, you can almost hear the water splashing by. From fingerlings, all the way up to 8 lb. monsters, the trout at Otter Creek Trout Farm are a sight to behold. You can image your kid’s first experience watching a 20+ inch trout as it cruises by, just out of their reach. How exciting! Pond Fishing is available to all. Otter Creek sells their trout by the pound, and it’s keep what you catch. Pond fishing trout average about 1 pound to 1.5 pounds. It’s tough to beat fresh NC mountain trout, so definitely plan on catching some while at the farm. Alex will even clean them up for you! Whether you fry them, bake them or grill them, you can’t go wrong. If you’ve never cooked trout before, it’s usually best to start simple. Try this delicious trout recipe, for starters. Also, be sure to ask Nicole about her herb garden. Fresh herbs would pair well with your fresh mountain trout… hint, hint! Have you ever had a goose egg? Probably not. I hadn’t either until my trip to OCTF. I came home with a humongous goose egg… and it was delicious! I know, random mention, but this IS a farm, ya know?! 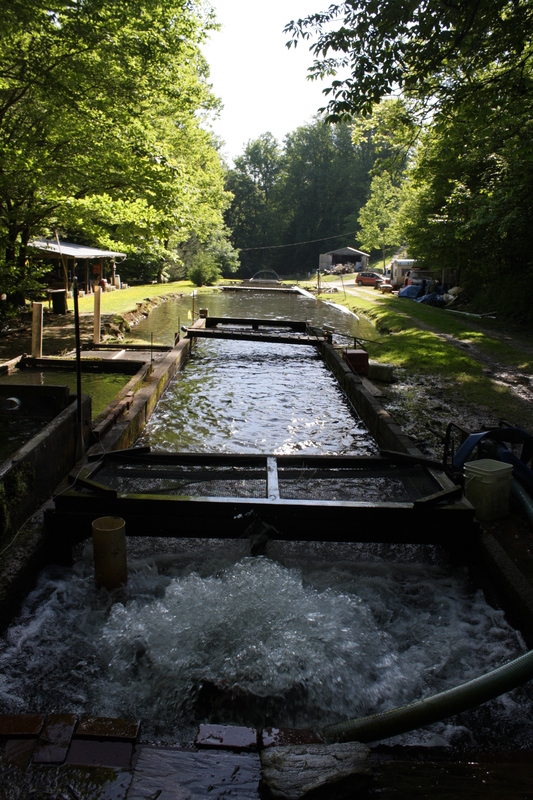 Now, start planning your trip to Otter Creek Trout Farm! Trout Fishing is on the rise in western North Carolina, and rightfully so. The rise in popularity for the sport of fly fishing here can be largely attributed to Jackson County’s creation of the “first and only fly fishing trail in the United States,” the WNC Fly Fishing Trail. The creation of the Trail helps cater to the one-third of all visitors that stop by the Jackson County visitor center with trout fishing already in their sights. The Trail boasts a diverse selection of mountain trout waters including: Hatchery Supported, Delayed-Harvest, Wild, Wild Natural Bait, Catch And Release – Flies Only, Catch And Release – Artificial Lures Only. There is truly something for every level of experience. Before heading out, please take some time to familiarize yourself with the NC Wildlife Regulations that are applied to each body of water along the Trail. Hatchery Supported & Delayed Trout Waters: Beginner to Experienced. Expect to catch fish fairly easily. Wild: Experienced. You must use artificial single-hook lures, making for a much more challenging day on the water. Wild Natural Bait: Intermediate to Experienced. The use of natural bait such as worms makes it a little easier to attract a wild and cautious trout. Catch & Release (Flies/Artificial Lures Only): Experienced. The lure restrictions make for a challenging day, and releasing the trout properly takes some knowledge. The Stretch: An overview of how long each body of water is. Numbers or Size: Will you catch a lot of small to medium sized fish, or will you catch a trophy? Another feature of the WNC Fly Fishing Trail in Jackson County is their detailed, waterproof map of the trail. The maps are complimentary and can be downloaded from the website, picked up at the Jackson County Chamber of Commerce, or you can contact the Jackson County Tourism Authority (800-962-1911). The Trail even has a “Trail Pledge” that everyone is asked to make before heading out. “As a true sportsman, I pledge to never litter and to avoid trespassing on private lands. I will respect the rights of property owners, and always leave the streams in better condition than I found them.” I don’t know about you, but I can get on board with this! See more articles and info like this via our On-Line version of Stay And Play In The Smokies the magazine here. As you ride along U.S. Highway 441 (Newfound Gap Road) this spring you’ll see, “No access beyond this point”. Before you start to say “What have we done?”, or, “there is nothing to do, lets turn around!”, we would like to introduce you to the ‘last stop’ along the NC side of 441 this spring, Smokemont Campground. 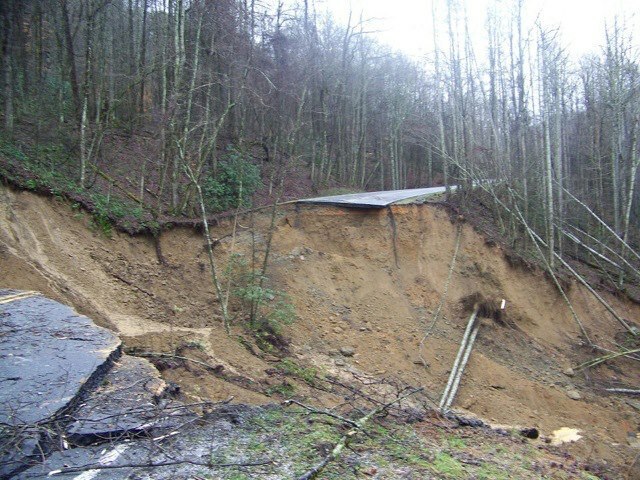 Note: The recent Smokies landslide repairs will be completed May ’13 (for more info on the recent landslide, see ‘Bryson City’ pg. 28). The 200 foot wide landslide in the Smokies happened January 16, 2013 and is set to be repaired by May ’13. 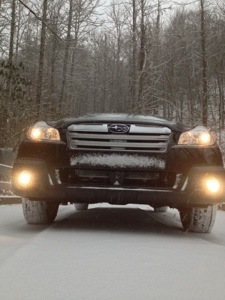 Don’t let this hinder your visit to the NC Smoky Mountains. We are STILL open for business! Smokemont is an outdoor lover’s dream. If front country camping in an RV or tent is your thing this is the spot. Maybe you’re looking for easy accessible back country camping. If so, GSMNP back country campsite number 50 is only a short hike away. So as you can see, we’re already off to a great start. 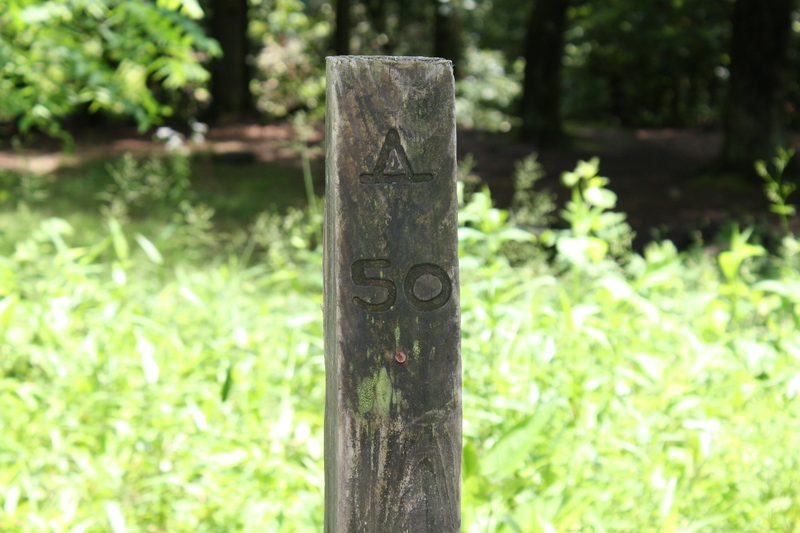 You’ll see this post at the entrance to backcountry campsite #50 in Great Smoky Mountains National Park. Access this campsite via Smokemont, Bradley Fork Trail & Chasteen Cr. Trail. 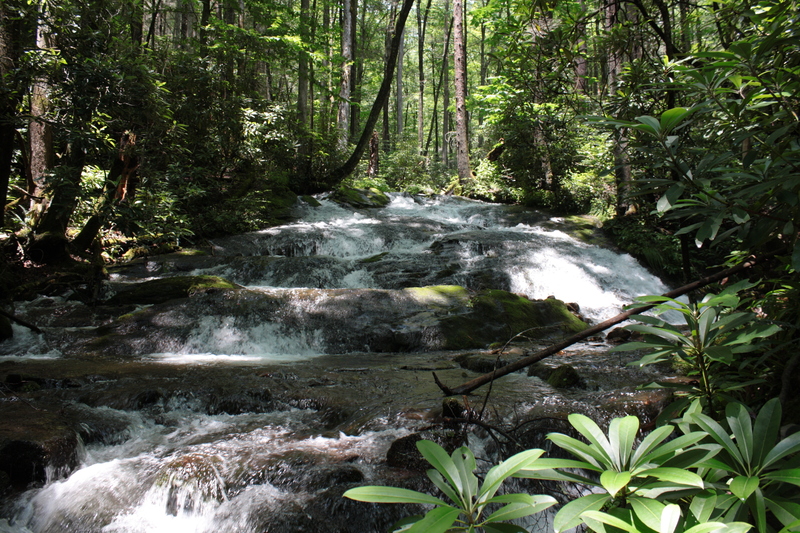 One of the things we love most about the Smokemont area of Great Smoky Mountains National Park is the water. 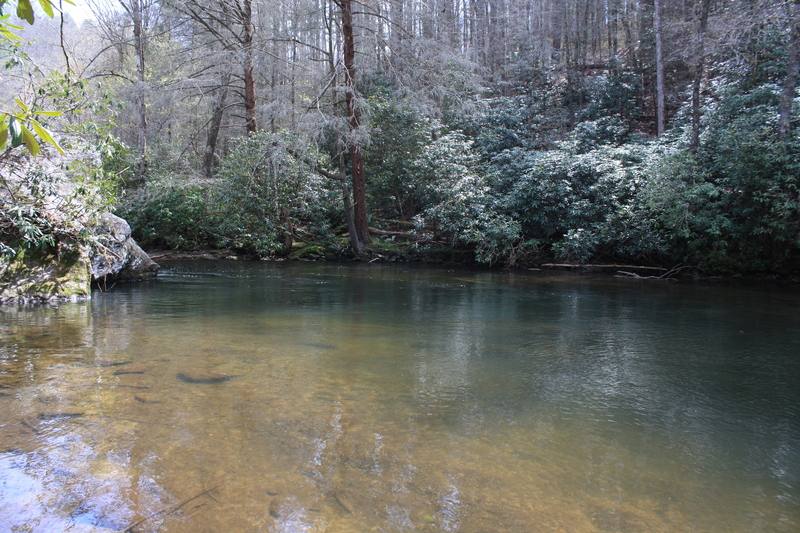 The Oconaluftee River and Bradley Fork converge within the campground area, creating an oasis for trout fishing, swimming & more. After setting up camp, check out the awesome hiking possibilities Smokemont has to offer. Just another reason to plan a trip to Smokemont. Head out along ‘Bradley Fork Trail‘ as it follows ‘Bradley Fork’ for just over 1 mile. For even more water fun, take the ‘Chasteen Creek Trail‘ for 0.4 mile up to ‘Chasteen Creek Cascades’. Find the great little spot at the base of the cascades to sit, relax and enjoy the Smoky Mountains at their best. Chasteen Creek Cascades tumble down and over the rock formations for about 50 feet. A peaceful location only 1.6 miles from Smokemont Campground. 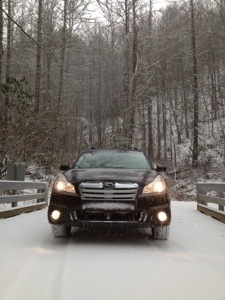 Located near the entrance to Great Smoky Mountains National Park via Cherokee NC. This state-of-the-art center & historic property is an excellent resource for Smoky Mountain History. Plan at least a half hour here. Located near the entrance to GSMNP is the end of the Blue Ridge Parkway, ‘America’s Favorite Drive’. We suggest hoping on here and driving up to ‘Waterrock Knob’ for a hike, long-range views, and a mile high picnic. 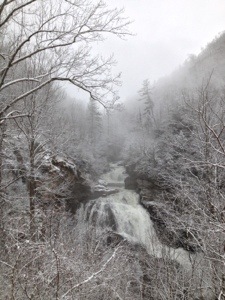 – Located outside of GSMNP, but just a short, scenic drive away you’ll find the near 200 foot, Mingo Falls. Take Big Cove Road (near the GSNMP entrance) for 5 miles until you reach the parking area. Get your heart pumping with a 160 stair hike to the falls. 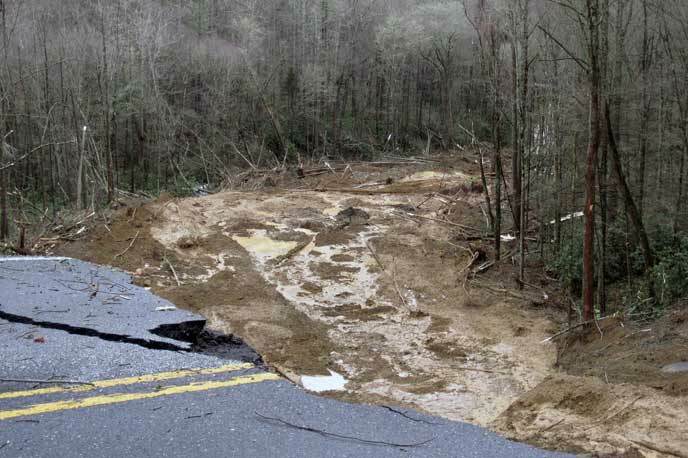 You may already be aware of the recent landslide that occurred via U.S. Highway 441 (Newfound Gap Road) in Great Smoky Mountains National Park, on January 16, 2013. If not, the landslide happened near mile marker 22 between Collins Creek and Webb Overlook, on the NC side of the Park, sometime around 9:30 that morning. The landslide is a 200 foot section of this heavily traveled highway, between Gatlinburg, TN & Cherokee, NC, that extends a near 1,000 feet down the slope near Beech Flats Prong. Initial reports from the National Park Service stated that an estimated completion of the repairs would be around May or June. However, breaking news on February 8th suggests that the completion date could be guaranteed sooner than originally expected. According to the National Park Service (NPS) Public Affairs Office, the NPS and EBCI (Eastern Band of the Cherokee Indians) have partnered to launch an early completion incentive proposal with the contractor. $18,000 will be awarded for each day the project is completed prior to May 15, 2013, up to a maximum of $500,000. The NPS and EBCI have both agreed to potentially $250,000 each. But, along with what seems to be lucrative monetary incentives also includes monetary disincentives. For each day after May 15, 2013 that the project is prolonged, $18,000 will be charged to the contractor. This will help insure the project is completed as planned. Franklin NC – Groundhog Day 2013 brought snowfall to the western NC area… A couple of inches and still falling as I type this from a booth at MiCasa Mexican Restaurant in Downtown Franklin NC (ha). Although Punxsutawney Phil called for an eay spring this morning, we’re hoping for MUCH more snow! What about you? Western North Carolina trout fishing is one of the most popular outdoor activities that is enjoyed by both expert fly-fisherman, and kids alike. Our area boasts an almost endless amount of pristine mountain waters that offer many different types of trout fishing opportunities. In this post, we want to share our opinion on the Cullasaja River, along the Cullasaja River Gorge, between Franklin & Highlands, NC. The Cullasaja River is a ‘Hatchery-Supported Waters‘ river that receives a good number of Rainbow, Brook & Brown trout throughout the year. The ‘stockers’ (as we like to call them), are stocked from several different points along the river, usually around bridges. If you’re lucky and time it just right, you could find yourself in the middle of a recent stocking. If so, you’ll have no trouble catching fish! Even if you don’t hit the jackpot, you’ll still be in good shape to catch some mountain trout. It seems like every time we walk over a bridge along the Cullasaja, we see a few trout swimming around below. One such bridge accessed via ‘Goldmine Road’. This is a popular stock-point and offers very easy access to some nice fishing spots for any level of fisher. Although the Cullasaja River is hatchery-supported, there are wild trout to be caught… If you take the time to find them. The majority of fishing ‘pressure’ is located around the bridges, the pull-offs along US Highway 64, waterfall/swimming holes, etc. The trout you’ll find near these locations will more than likely be ‘stockers’. Please don’t get me wrong, there is nothing wrong with these trout; they are clean fish and are perfectly good to eat! The reasons we enjoy catching wild trout vs. the stocked variety are: color, fight & challenge. Wild trout have prettier color and skin patterns than stocked trout due to their exposure to natural surroundings their entire lives. More times than not, a wild trout will put up more of an aggressive ‘fight’ during the catch and while landing the fish. Think about it this way: a ‘stocked trout’ is fed… a ‘wild trout’ has to hunt for it’s food. Which do you think would be more aggressive in it’s pursuit? You’ll find it harder to catch a wild trout than a stocked trout. Why? Well, we can use the same comparison as we did above in the fight description. 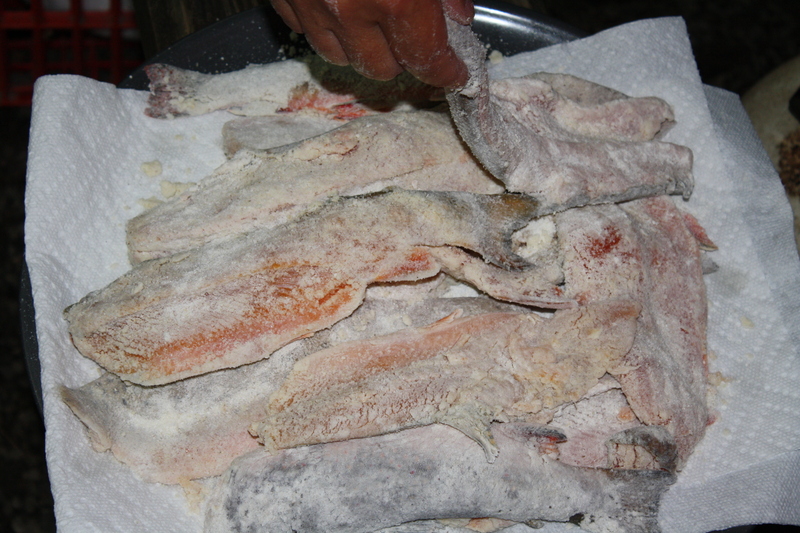 After being fed for the majority of it’s life, the stocked trout will bite at just about anything that resembles a food source. This isn’t the case for the wild trout because it has had to hunt for it’s food to sustain it’s existence. This makes the wild trout much more selective in it’s diet. The wild trout knows what will benefit it the most. Having described why we prefer catching wild vs stocked, we hope you get a better picture of why this is. So, are you ready for our recommendation?? We recommend wading the Cullasaja River from any of the easy access points located along U.S. Highway 64 between Franklin & Highlands, NC, for a chance to catch some wild trout. Remember you can use natural or artificial bait in this river, but we recommend using artificial. By doing this, you’ll make catching either type of trout (wild/stocked) more of a challenge, and you’ll save a lot of time not having to bait your hook!